These free vintage labels will help you create a whole new look when you use them to put new life into bottles, boxes, vases, cans, wine bottles, and whatever else you want to stick them to. Why not add a bit of history and even glamour to your everyday life? The free vintage labels below include vintage food, fruit, can, apothecary, soap, and perfume labels that you can use to makeover virtually any container you find around your home, at garage sales, or at your local thrift store. Tip: You can attach these free vintage labels in a variety of ways including printing them on label paper or adhering them using double-stick tape, a glue stick, or a decoupage technique. We also have some other free vintage labels especially for canned items and address labels as well as some other, more modern free labels for wine bottles and water bottles. 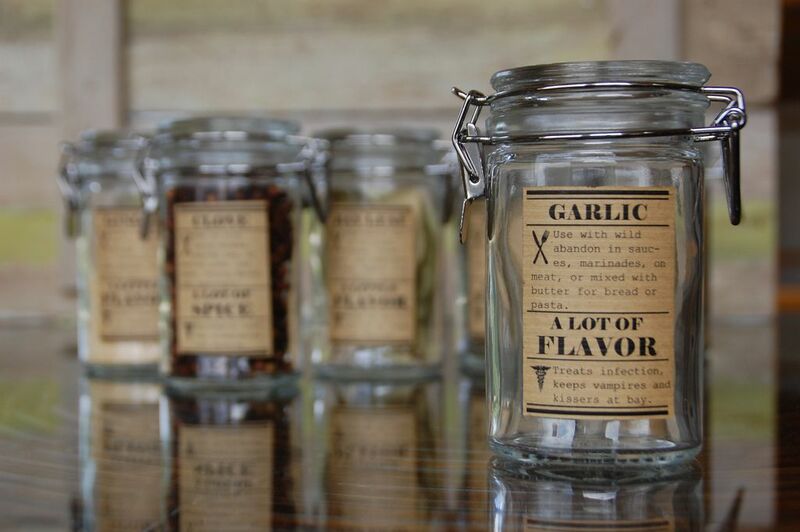 Here are some vintage style spice jar labels that will not only help you keep your spices organized, but it will do so in style. You can print these labels on any paper but you can get this look by printing them out on kraft paper. These are some beautifully designed vintage labels that are perfect for some decorative bottles in a bathroom. There's a free vintage label for lotion, elixir, tonic, and syrup. This Flickr set has some lovely free vintage labels from France. Just download the free vintage labels and use them in whatever project you are working on. There are so many free vintage labels at The Graphics Fairy that you won't be able to decide which ones you want. Each day there's a new free vintage label available for download. Quite impressive! These free vintage labels can be printed out and added to your spice bottles. Make them look even more vintage by staining them with coffee or tea. There are also some similar free vintage labels that can be used for your tea canisters. This collection of 16 free vintage labels are all left blank in the middle so you can add your own text. This means you can make a vintage label for practically anything in your home! There's a wide variety of designs to these free vintage labelscanbut they all are intricate and quite lovely. These free vintage labels are all round and are just waiting for you to enter whatever text you'd like. There are 12 different designs here all with a slight vintage feel to them. Yet another set of free vintage labels over at Eat, Drink, Chic! These free vintage labels can can to bottles for oil and vinegar and boxes for other items.